Everybody has a phone plan. Some are better than others, but you get what you can afford and now that Telus has turned us down for a replacement payphone we’re looking at plan B. The price is right, but unfortunately includes no long distance. Our plight for an emergency public phone was reported by multiple media outlets today. Global News did a story which ran several times. At 5 p.m. we heard Telus representative Shawn Hall say “The phone’s been damaged multiple times over the last couple of years. Costs us about $5,000 to put a new phone in each time.” That does sound like a lot of money to pay for multiple incidents. However, nobody here remembers more than one time in recent history where there was damage – and that was a broken handset. Is it possible that Hall is including the many times that the phone was non functional because their service to the whole area was borked? From the Coalmont perspective that phone has been very important for a long time. Some of the serious emergency issues have already been mentioned, but one person from Granite Creek also pointed out that when their kids needed a ride home because the school bus failed to show up in the snow, used the payphone to call home so they could get picked up. One could be tempted to say that the power went off “as usual”, but that would perhaps be a bit harsh. On the other hand we’ve had a lot of power outages lately. Today it was only off for 1 hour and 45 minutes, which coincidentally was the same length of time it was off the other day. The times that it goes off for only a few seconds and then comes back on with an electronics damaging surge should also be mentioned. Perhaps a knock-on effect from Friday’s telephone disaster, but the phones were out today as well. The blackout was only three hours in the middle of the day, but that’s still well beyond what is generally considered acceptable in the 21st Century. Telus purports to “continually upgrade to better meet our needs“, though with the level of education that kids are getting these days, I suppose one could excuse them for not fully understanding the meaning of the word “better”. Sarcasm aside, what we saw today did indeed show that Telus does not want the world to know what they are doing here. The lines went dead around 2:25 p.m. Checking the Telus Home Services Outages web page still showed nothing up until four o’clock or so. One could assume that Tulameen (the only near choice there) was not effected. However, a little while later, there it was. Click on “Current outages” and the area (though not Coalmont) was listed. The phones came back on before 6 p.m. Not long thereafter, if one clicked on the “Resolved outages” link there was nothing there. What is particularly interesting is that right underneath it says “If you no longer see your outage here, we resolved the issue more than 24 hours ago.” Oh really? This outage was listed for a couple of hours, with not even a nod to Coalmont, and taken off right away. Clearly Telus doesn’t want the world to know that there is a problem here. It gets worse than that. As mentioned many times before, most people have no alternate ability to call the phone company when the lines break. Nevertheless, Telus suggests that one “call 310-2255 to inform us of your service interruption“. What is particularly interesting is that these 310 numbers are only reliable within the company that owns them. You often can’t call them from another service such as a cell or other phone. Adding an area code will sometimes work, but likely not. There is, however, a number for general use which can be used. Try (888) 811-2323 and after going through a lot of menus, you will end up talking to a real, and polite, person. Unfortunately you won’t be connected to the repair service. The best this agent can do is file a report. How quickly that gets picked up by the relevant repair people is unknown, but the agent will try very hard to set up an appointment to have someone come out to look at your telephone next week. Apparently people’s telephones are very interesting and they have technicians who enjoy looking at them. It is impossible to tell a Telus agent that the cable which supplies connection to this town has been pulled up by the snow plow again. This is not looking good. In fact, Telus is not looking good. I made some effort to get a telephone number which would lead to a service centre where they could address broken lines immediately. It was my hope to be useful to both Telus and this community. As it turns out, the people at Telus were unable to give me such a number. After first giving me one which turns out to be wildly wrong, they consulted with others in the office and came up with a number which they thought might work – it didn’t. Putting all this together, it becomes clear that although they have pleasant and polite people manning the front desk, Telus as a company has questionable intentions. They don’t want to hear from us. And they don’t want anybody else to know what is going on here. If Coalmontians are to have regular telephone service such as we’ve had for the better part of a century, it’s looking like Telus isn’t a company who can do that. As for 24/7 access to 911. Forget it. Rumours and conflicting reports are muddying the waters after coal mine spill turns river black. We need to talk. We’ve been waiting to get information about what is happening with the Tulameen River water. There’s a lot of very angry people and it would be appropriate for the Coalmont Energy Corporation to tell them what is going on. Especially since it’s been two days and the story is starting to circulate elsewhere. Notably, Global News has a story with facts which are different from what we know here. What is going on? Global reports that there was a failure of “a coal mine tailings pond” but earlier information from the mine indicates that they are not using a tailings pond at all. (see story) Processing water is being recycled and all they do is top it up. The pond is there from the previous company, Compliance Coal, and is not being used now. On the other hand Keith Meldrum of CEC is reported as having said that the spill was caused by a malfunction at their new plant. Failure of a tailings pond is indeed a malfunction, but if they’re not using it then wouldn’t the cause lie elsewhere – like somebody doing something they shouldn’t have? So now we have more questions than we had before. According to Global, Meldrum said that the effect was believed to be mostly visual and that there was minimal impact. This is likely true, but telling the residents of Coalmont about this would be a welcome gesture. We are the people who’s daily lives are potentially impacted by this spill. Meldrum is also reported to have said that the tailings are not toxic because the Blakeburn coal doesn’t contain sulfur or blasting contaminates. Was he not told that they’ve been blasting lately? Besides, without reference, this seems like a bold statement. The current plant is designed to be very clean, and is presumably a known factor, but the tailings pond is left over from a previous company with unsophisticated processing, and who knows what they could have left behind. Apparently Interior Health also does’t know we exist. Their reported statement that there are no wells within 18 km is a jaw dropper. Why would they say that? We’re all on wells in this community and it is a narrow valley so everything is close to the river. Some people have a well within a few feet of the Tulameen and they in particular would like some reassurance about their water. It is worrying that we’re invisible to the government authority which is charged with regulating the safety of drinking water in this province. Coalmont is on its way to acquiring some community property. We need to do this now, because in a few years crown land will be difficult or impossible for us to get. Our Area ‘H’ representative, Brad Hope, is putting in a bid for the Regional District to get two contiguous lots on the corner of Main and Campbell Avenue. This would probably be in excess of 35,000 square feet, but the exact details of what we end up with will not be known until the application gets processed by the Provincial land authorities. If all goes well this should take something like a year, perhaps less if we’re lucky. The arrangement will be a Nominal Rent Tenure Agreement where we will pay something like a dollar a year. The spark for all this was a difficulty in finding a place for our meetings. Solving that problem is an obvious first step, but one can imagine that some day we could also want a volunteer fire hall. In any case, we can’t start to make realistic plans for what we are going to build until we have the land. Building something is also a more difficult endeavour for us. There will be real work and real costs involved. We probably have to raise some money ourselves, which we can certainly do, but the ongoing cost of maintaining a building requires careful consideration. I believe that this is where we have to be both frugal and clever. We should not settle for something temporary or inferior. We don’t need everything at once, and if we don’t get carried away, we can have something beautiful and small which we can afford to maintain. In any case, getting a piece of public land is an important development for our little town. Building a meeting place is downright exciting, although it will take some time. In the meanwhile we can always dream. And we should. [Submitted] Dave Wilkinson and myself, Debbie Fortais are the new operators of the Coalmont Hotel. Some of you may have met us already, but for those who haven’t, let me introduce us. Dave and I are both from Kelowna. I own and operate a licensed, registered and bonded cleaning business in Kelowna, Zeus’s Roost Professional Cleaning Service. I have been in business since November of 2006. Dave assisted me with my business until October of 2012. My background is in business. I have been operating my own businesses since 1996. 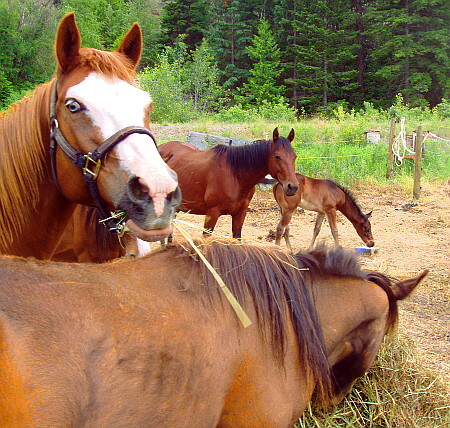 I am originally from Campbell River on Vancouver Island but relocated from Vancouver to Peachland in 1994. Dave was born overseas and traveled globally with his family until settling on the family farm in Saskatchewan where he operated a 1100 acre mixed farm. He has experience in the trucking industry, commercial aviation industry and has been involved in Federal Politics since 1999 . Dave does not fly or drive trucks anymore due to health reasons. We came to Coalmont not knowing what to expect. In fact, neither one of us had ever heard of Coalmont up until 8 weeks ago! What a beautiful spot this is! As some of you may know, the Hotel is under scrutiny from the R.C.M.P. and the B.C. Liquor Control Board. Dave and I originally came here to manage the Saloon for the present owner. We were and still are required by law to run the Hotel in accordance with Provincial Liquor and Food Safe Laws. There seems to be some misunderstanding in town regarding what we are doing and planning here at the Hotel so I would like to clarify what we are doing now and what we plan for the future for the Coalmont Hotel. We have some new signs around town. 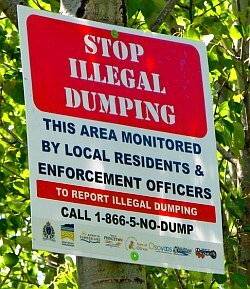 The illegal dump at the end of Main Street has irked some residents and now the Regional District has put up a sign. The dump is still there, but it is expected that the RDOS will be removing that in due course. Note the number on the sign if you want to report infractions. Some other issues have been overdue as well. 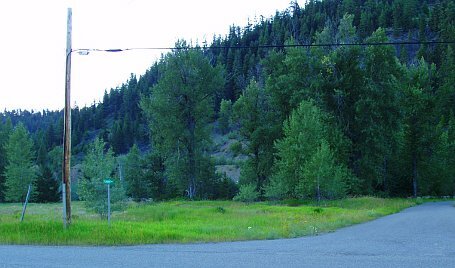 The Granite Creek historical town site has been much used on long weekends by people from away who do not seem to share any reverence for the site. There were no less than 10 fire pits and one was several metres in diameter. These have now been dismantled and cleaned up. The half burnt garbage has also been removed in an effort to discourage more. This work was done by Bob and Diane Sterne who were kind enough to also provide the sign. Right in the middle of a conversation I was having on the telephone yesterday afternoon, blip, the line went dead – it still is. This is not unusual and we’re used to it. Talking with people who have been here for a long time, it becomes clear that we’ve had rotten lines for some years now. Sometimes it takes a day, but often the phones are back in a few hours. However in this case it looks like they’re going to be down all night as well. As an Area H resident who has spent some time gathering and disseminating factual information about the Princeton Aquatic Centre Project, it has come to my attention that some people don’t quite understand what is wrong with the Referendum. Everybody gets to vote and that’s democracy – right? No it is not. There is more to democracy than just having an opportunity to vote. The outcome of the vote should be representative of what most people would like, and people need to know what they’re voting for. In this case the voting is set up in such a way that Area H will be very poorly represented by any outcome. Of course almost everybody is in favour of having an aquatic facility, regardless of where they live or whether they will make use of it or not. The arguments start when we discuss cost and who will pay for it. That is what the referendum is about – not if we want a pool. Let me start by pointing out that if everybody in Area H votes “no”, and everybody in Princeton votes “yes”, then the referendum passes. That is because there are more voters in that town. Another disparity is that there are many, possibly eight times, as many people in Princeton who won’t pay the tax, regardless of the outcome. They probably won’t object to an aquatic centre. But the question is, why is Area H involved to begin with? Five years ago the statistically rising median age was 56 years and there are very few children. Add the fact that 46% don’t live here and come mostly in the summer to enjoy outdoor activities, and it becomes clear that the demographic is not likely to be one that will participate much in any indoor aquatic activities taking place in a neighbouring municipality. Especially if it involves spending an hour in a car. Regardless, if this passes and we have to pay for a pool then the people in Princeton, who arguably have better access to this proposed facility, would only be paying 39% of the cost. This referendum simply does not ensure a match of the benefits and costs which is legally required in regional districts. If you care about the democratic process you will want Area H to vote for themselves and if you are also a resident there – you will demand it. After putting up the Coalmont Centennial pages there has been more interest in this historical event. It was hoped that the Centennial Guestbook would generate some talk about what we could do to celebrate. Indeed, someone came to the rescue – Coalmont Energy Corporation. They have offered to sponsor a party for us here. Thank you CEC! Every year there is also a Blakeburn reunion dinner held for the last survivors of that era. Those events have been organized by Lillian Young who grew up right here and knows how it was in the heyday of the town. 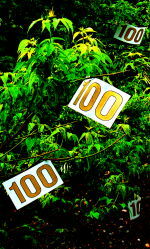 This year she will organize the reunion dinner in Coalmont and we will have that together with our Centennial Party. There will be a tent set up for the event, and a BBQ with burgers starting at noon. The dinner will start at 4:30 pm. This is a late date to be planning this sort of thing, but hopefully we will find musicians who will want to come and jam. We welcome other ideas for entertainment as well. Watch the Party Page for updates. Questions and suggestions can be directed to party@coalmontcentennial.com See you there! 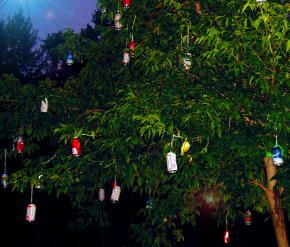 The magic tree has sprouted new fruits again. This time it is even more unusal. To me it is a reminder that summer is here, the long weekend is coming up, and it’s party time. Perhaps this is also a good time to suggest that there are two sides to that story. Weekends are getting busier and noisier. One person counted over one hundred quads and dirt bikes racing by his place in one day. I’m sure many of those were repeats though. Indeed, people going back and forth, kicking up dust, is one of our perenial problems here. I guess we’ll just have to live with it. I’ve never liked adding more rules to control our society. The more people sort things out by themselves the better, and to my mind, the more civilized. However I do notice more and more complaints about noise. We don’t have a noise bylaw in Area-H, but judging by the number of times it gets mentioned, my feeling is that there is support for one. I guess the up side is that even though rules like that don’t always get enforced, there are usually also a few people who take them seriously. There will always be a few rowdies around. I think we have to live with a bit of that. Many people like to party and celebrate once in a while. 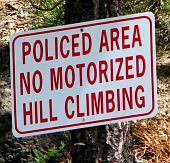 We also have to realize that the huge number of off road vehicles that we see is the reason that most people come, and why some residents moved here. However, there are times when things get over the top and the rest of the community gets involuntarily volunteered to participate in a way they didn’t want. I notice that the ambulance comes by a couple of times every long weekend. That’s when fun gets to be not so fun. I also notice the police have been to town a few times recently. I don’t know the details of the issues involved but maybe it’s better that I don’t stick my nose is some of that business anyway. I’m probably not the only person who thinks that way, but I’m probably also not the only one that wishes the police were here when we really need them. My thought is, you can’t win that one, but that there is not any more crime here than elsewhere. It is mostly during the weekends that there is trouble. There is always a problem with drinkers and yahoos on long weekends. Most visitors are quiet and respectful. There is usually a nice crowd over at the Granite campsite. Some have been coming for years. We also see campers in odd places sprinkled around on crown land. Of course, there is no knowing what they get up to, and we can only assume that they are respectful of the area.